Boston College High School is located at 150 Morrissey Boulevard on Boston's Columbia Point, near the UMass Boston campus and directly across from the old Boston Globe building. Take Route I-93 (Southeast Expressway) south to Boston. Take Exit 15 off the I-93 expressway. Take a left at the bottom of the ramp and proceed past the T station (JFK/UMass). Take first right at the rotary onto Morrissey Blvd. (stay in the right lane) At the bottom of the hill, bear right onto the UMass service road. Proceed through the set of lights in front of the Boston Globe Building (BC High is opposite at this point). At the second set of lights (the entrance to the UMass/JFK Library complex), take a left making a U-turn back onto Morrissey Blvd. Immediately bear right onto the service road and use the second entrance into BC High. Visitor parking is available directly opposite the main entrance of the school. Take the Massachusetts Turnpike (I-90) to Boston. Follow the above directions from the North. Take Route I-93 (Southeast Expressway) to Exit 14. Merge off the ramp onto Morrissey Blvd. and proceed over the ridge. Immediately after the lights at the entrance to UMass, bear right onto the service road and use the entrance into BC High (second driveway). Visitor parking is available directly opposite the main entrance of the school. Located on the Red Line, JFK/UMass is only a five-minute walk from BC High. Walk up Morrissey Blvd. towards Star Market Supermarket and cross over the foot bridge. BC High is a few yards from the foot bridge on the left. Connections can be made to the Red Line from all parts of the MBTA system. What time may I drop off my child? Most camps and special programs begin at 9 am. Please drop your child off between 8:45 am and 9 am. If the clinic starts at a different time, please drop your child off fifteen minutes before the start time. Do you need any medical information for my child? As required by Massachusetts State Law, each sports camp athlete must have on file a completed physical, dated on or after June 2018 as well as a current record of immunizations by their physician. Are there any minimum enrollment numbers for a curse, class program to run? All classes require a minimum of 4 registered students or the class may be cancelled. We will make a decision on any classes that may need to be cancelled two weeks prior to the start date. If we have to cancel a class, we will notify you by e-mail and refund all of your money. To register for a Sports Clinic, Grades 4-8 Specialty Program, or an Academic Enrichment course, please click here. You will be directed to our online registration form. If a program you select is full, please email Beth Johns-Thomas at summer@bchigh.edu. Once registered, you will receive a confirmation email. Yes, lunch is provided for an additional fee. Please see the Parent Handbook for a complete menu of items available thru our snack bar Monday-Thursday. Snacks and beverages are always available in our vending machines. For the Sports Camps and Specialty Programs, can my child be picked up after 3 or 3:30 p.m.? We do not offer supervision after 3:30 p.m., therefore we ask that you pick up your child be picked up no later than 15 minutes after the end of their program or camp. How do I reach the summer programs office during the summer? The year-round phone number for the Director of Summer Programs Beth Johns-Thomas is (617) 474-5181. Or the Assistant Director of Summer Programs, Johns Lynch at (617)-474-5180. You may also contact them via email at bjohnsthomas@bchigh.edu or lynch@bchigh.edu. All registrations are processed on a first-come, first-served basis. All registrations for the Sports Camps, Specialty Programs, Enrichment Courses, Academic Courses and Academic Credit Recovery courses must be made online. Registration begins on February 11, 2019. Payment for a program, camp or course must be paid in full upon registration. Some programs fill quickly, so we encourage you to register early. A student is not enrolled until the tuition is paid in full. Please note that your registration fee includes a $100 per session, per child non-refundable, non-transferable deposit. Once we process your payment online, this deposit is absolutely non-refundable. Payment in full must be received by June 1, 2019. You may withdraw your child from any session prior to June 1, 2019 and we will refund any payments we have received less the applicable non-refundable deposit. There is no refund of any registration fees if you withdraw your child from any session after June 1, 2019 without a physician’s note. As required by Massachusetts State Law, each Specialty Program camper or Sports Camp athlete must have on file a completed physical, dated on or after August 2018 as well as a current record of immunizations by their physician. In addition, we require all participants to have a completed Health History Form. The forms can be found in the download section. All medical information must be received by June 1, 2019. Transportation is not provided. Please drop off and pick up your child at the front entrance of the school or at the Student Affairs entrance on the right, back side of the school. The Director of Summer Programs reserves the right to dismiss a camper when in her judgment the student's behavior interferes with the rights of others, the smooth functioning of the program, or violates the camp’s conduct policy. In such cases, no refunds will be given. If your child is registered for an Academic Course and wants to attend a Sports Camp, we will adjust your Sports Camp registration fee to reflect the hour(s) she/he will be missing from the sports camp while in class. To request this adjustment, please contact the Summer Programs office at 617-474-5181. 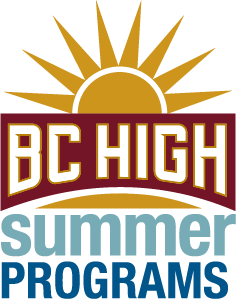 Summer Programs at BC High does not discriminate on the basis of race, color, creed, sexual orientation, religion, national or ethnic origin in the administration of its admission and education policies, athletic programs, employment, and other activities. A complete booklet of policies, procedures and other program information with regards to BCH Summer programs can be found in our Parent Handbook.